From the Balancing Rock car park a rough track climbs up a rock formation, providing views of Balancing Rock—a spectacular limestone outcrop. Take a moment to enjoy the view and photograph the surrounding open woodlands. Wullumba art site is also located to the right of the car park. 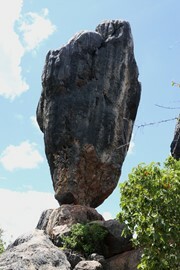 Balancing Rock car park is 2.5km from Chillagoe. Drive along Frew Street to the edge of town before crossing a cattle grid near Chillagoe Cattle Station. From here the route is well signposted. The walk is a circuit so there are two entry points from the carpark. The walk is graded ‘moderate’ due to the uneven rock surface. 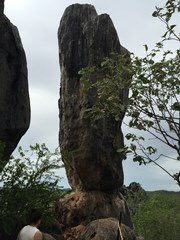 You will make your way uphill to a series of rock formations passing a few small caves along the way. You can walk up to a vantage point near Balancing Rock to view the entire Chillagoe region. The circuit then continues down hill and back to the car. When facing the circuit from the carpark if you walk to the far right there is a cave art site about 20m away. Well sign posted, you can’t miss it. No costs associated with this walk. This is a very easy walk but well worth it for the quintessential Aussie bush setting. I simply love the smell of Australia and the air is clean out here. This was a great addition to our caving day. The art site was not as impressive as the Archways but still worth a visit.